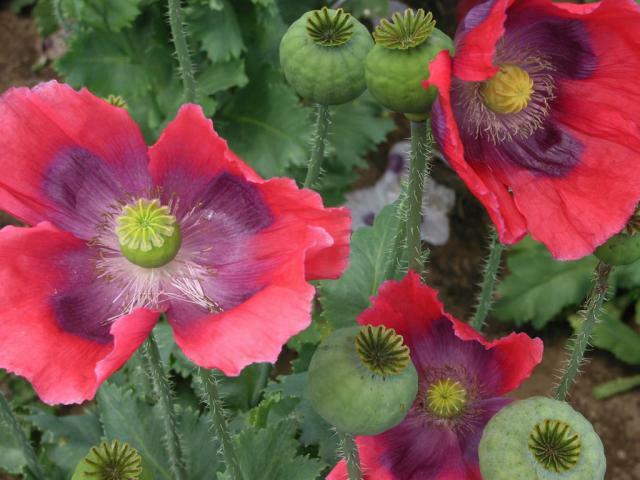 The opium poppy (Papaver somniferum L.) is a multipurpose crop. It is an annual erect plant, 60-120 cm in height, rarely branching, with ovate-oblong leaves. It bears large showy flowers and nearly globose to spherical capsules, containing small black, white, blue or brown kidney-shaped seeds (Shasany et al., 2007). 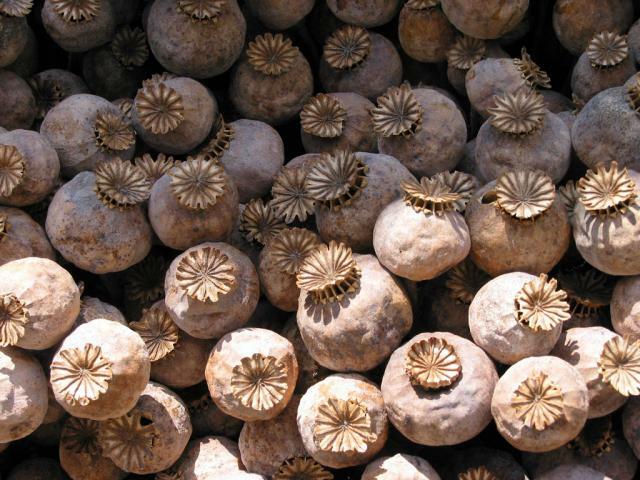 The opium poppy is generally grown for the latex extracted from the immature seed capsules. The dried latex, or opium, is the source of many opiates, including morphine, thebaine, codeine and papaverine (EFSA, 2011). The oil extracted from the seed is used for culinary and pharmaceutical purposes, as well as for making soaps, paints and varnishes (Krist et al., 2005). The seeds, which are normally free of alkaloids, are used for birdseed and as a food item in confectionery and bakery food products (Rahimi et al., 2011). The main feed ingredient derived from the poppy is the poppy seed meal, which is the protein-rich by-product of oil extraction. The terms poppy seed meal and poppy seed cake usually refer to the solvent-extracted and mechanically-extracted by-products respectively. The poppy originated from Asia Minor or from the Western Mediterranean region (Akinci et al., 2003; Shasany et al., 2007). Its long history of domestication and breeding resulted in the development of many landraces, chemotypes and cultivars adapted to various uses and climatic conditions. Poppy cultivation covers a wide geographic area from Bombay to Moscow in the North and to Tanzania in the Southern hemisphere (Krist et al., 2005). 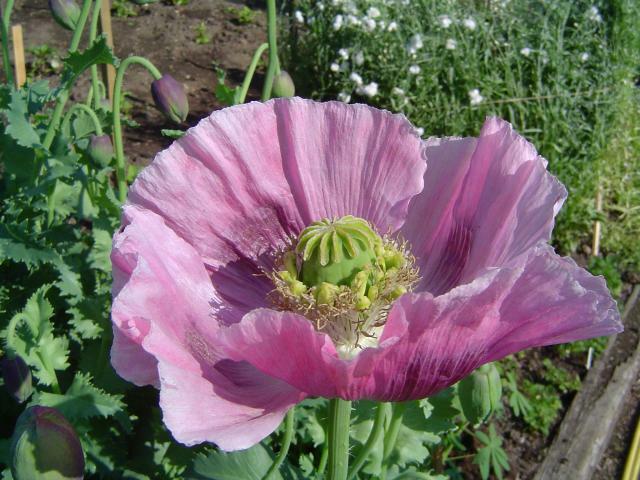 Legal poppy seed production is allowed by the United Nations in several countries. Turkey and the Czech Republic are the leading legal producers of poppy seeds (65% of the total production) (Rahimi et al., 2011; FAO, 2012). Poppy seeds are rich in oil, though the oil content is highly variable and ranges between 33 and 53% DM. White-seed varieties have been reported to contain more oil than blue-seed varieties (40 vs. 33% as fed). There are large differences in the fatty acid composition of oils even in seed samples taken from the same region: the contents of lauric acid (0-13.4%), palmitic acid (7.8-30.66%), myristic acid (0-1.1%), stearic acid (1.4-10.9%), oleic acid (13.2-36.8%), linoleic acid (18.4-80.0%), and linolenic acid (trace-9.4%) are very variable (Azcan et al., 2004; Krist et al., 2005). However, the seed oils generally have a high unsaturated fatty acid content (Rahimi et al., 2011). Poppy seeds are also rich in protein (22-29% DM). Poppy seed meal and poppy seed cake are generally rich in protein (30-40% DM) with a variable amount of fibre (up to 23% DM crude fibre). The oil content varies between 0.8-1.5% DM in solvent-extracted meal and 5-13% in the cake. 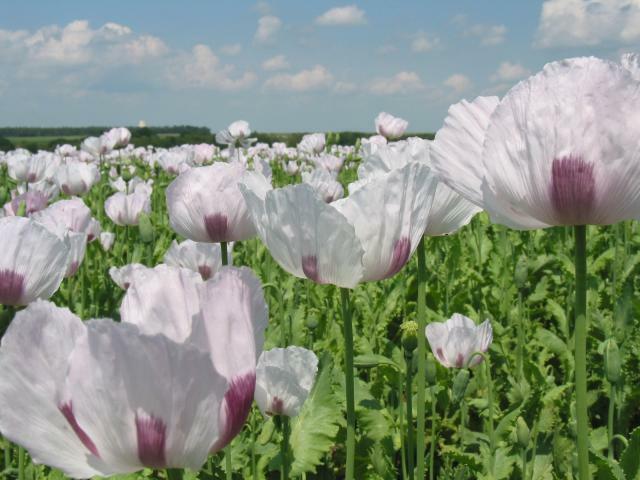 In some countries, such as Germany, only low-morphine poppy varieties are authorised for cultivation and are exclusively destined for the production of food or oil seeds. 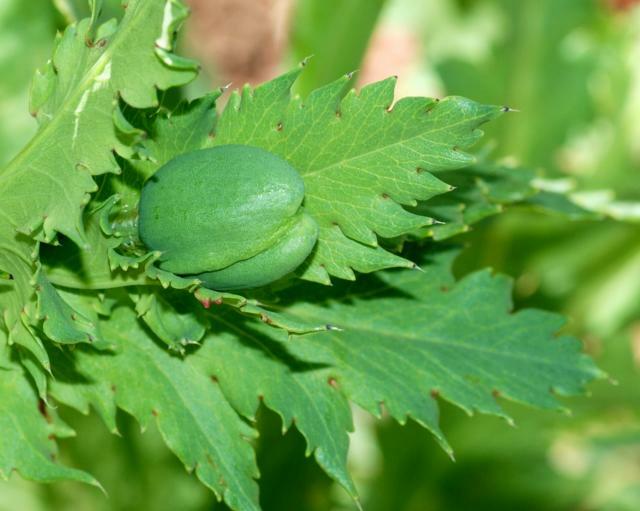 However, there is poppy seed production for food use from poppy varieties especially bred with high alkaloid content intended for pharmaceutical purposes (EFSA, 2011). 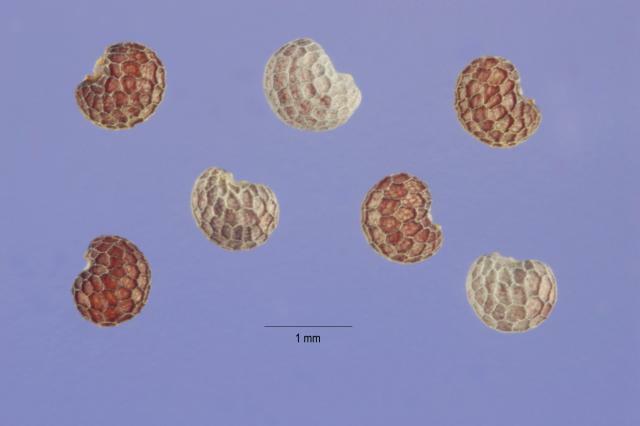 While poppy seeds do not contain alkaloids, bound forms may exist in the seed (Fairbairn et al., 1980) and the seeds can become contaminated with alkaloids as a result of insect damage, or through poor harvesting practices (EFSA, 2011). The pressed cake can be contaminated by capsule fragments, so it should be fed to animals with caution. The symptoms of poisoning are excitement, constipation and excessive salivation. Although deaths are rare, the poisoned animals take a long time to recover (Göhl, 1982). Poppy seed cake was once believed to cause drowsiness (Cornevin, 1892) but this was not confirmed in early animal trials (Annett et al., 1919). There is no recent information regarding the use of poppy seed cake and poppy seed meal for ruminants. In the 19th century, poppy seed cake used to be recommended in France for fattening cattle and sheep and was considered to be palatable for these species. Its lack of odour was appreciated for fattening purpose (Cornevin, 1892). A French agricultural manual from 1851 gives various examples of diets that include poppy seed cake: 0.4-2 kg/d for draught oxen, 1-5 kg/d for fattening cattle, to be introduced progressively, and 0.28 kg/d for finishing lambs. In such diets, poppy seed cake was usually mixed with beet pulp, cereal grains, legume seeds (linseed, horse bean), straw or hay. In some cases the poppy meal or the whole mixture was boiled in water (Payen et al., 1851). German trials with dairy cows observed that poppy seed cake gave a slightly lower milk yield and milk fat yield than groundnut meal (Hansen, 1906). In a trial in India, poppy seed cake did not affect milk yield and quality when compared to mustard seed cake in one cow and two buffaloes fed (Annett et al., 1919). There is limited information on the use of poppy seed meal in pigs though it was used to feed lactating sows in the 19th century (Payen et al., 1851). In a trial with growing pigs, diets based on soybean meal (included at 18.5%) and solvent-extracted poppy seed meal (included at 25-27%) produced similar growth rates at the same lysine-to-energy ratio, indicating that poppy seed meal had a lysine availability similar to that of soybean meal, and growth was not reduced by the poppy seed meal (Statham, 1984). Broiler diets containing 10-25% of poppy seed meal significantly increased live weight gain and feed intake, but did not cause significant change in feed conversion ratio and carcass yield. Pathological lesions in the organs of birds fed poppy seed meal for 42 days were observed (Bayram et al., 2006). In a further trial, poppy seed meal and poppy seed cake were included at 8 to 16% in broiler diets (replacing 50% to 100% of cottonseed meal). Differences in daily weight gain and feed intake were not significant (Akyildiz, 1984). Poppy seed meal (up to 15% in the diet) together with yeast culture (Saccharomyces cerevisiae) (0.10%) had some positive effects on egg weight and eggshell quality parameters (eggshell thickness) and no adverse effects on egg production and feed efficiency (Küçükersan et al., 2009). Poppy seed meal was used at up to 20% in the diets of growing Japanese quails without affecting performance (Bayram et al., 1998). It also replaced soybean meal at 20% without affecting body weight, live-weight gain and feed consumption (Yldz et al., 2004). In laying Japanese quails, the addition of up to 25% poppy seed meal to the diet increased egg production, feed consumption and feed conversion per kg of eggs, and per dozen eggs, but significantly reduced hatchability, mainly because of increased infertility and embryonic deaths (Akinci et al., 2003). Poppy seed cake was thought to be very unpalatable to horses (Cornevin, 1892).